Oh, so I'm not the only one! I often find myself spending precious work time going to the html edit mode to "clean up" ...for no other reason than to make it clean. You can leave a ton of extraneous tags and breaks without making a bit of difference in the published appearance of the text, but I still feel the need to edit the code to be as simple as possible . 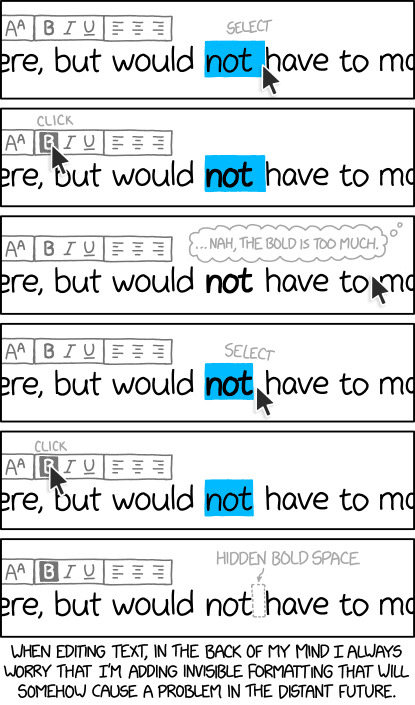 This is the latest comic from Randall Munroe at xkcd. So perfect. That is me every time!